California has invested heavily in policies, programs, and projects to conserve, restore, regulate, and manage its wetland resources. The ecological diversity of the state and its complex community of wetland managers challenge efforts to coordinate and standardize assessment tools and approaches. California therefore adopted a "regional" approach to program implementation. Components of the three-tiered approach are initially developed and implemented by select regional teams of scientists and partner agencies with oversight by a statewide steering committee. These approaches allow the state to build concepts and tools based on regional experience and then transfer this expertise to other regions. The State and Federal Governments have adopted a "No Net Loss" policy for wetlands, but currently have few mechanisms to track the implementation or success of actions meant to achieve this policy. The Wetlands and Riparian Corridors Action Plan is a compilation of goals and strategies developed in partnership with the Central Coast Wetlands Group (CCWG). To date resource limitations have stymied this Action Plan in its very beginning stages. The Integrated Watershed Restoration Program (IRWP), Central Coast Wetlands Group (CCWG), Elkhorn Slough Foundation (ESF), the Watershed Institute, and others are carrying out the bulk of current activity. Work with local jurisdictions to enhance the repair and replacement of sewer infrastructure to reduce leaking pipes and clogs. Inventory historic and existing wetlands, identify location, health, function and potential impacts. Develop and implement permit streamlining for restoration activities. Increase education and outreach for landowners and develop incentives for wetland protection. 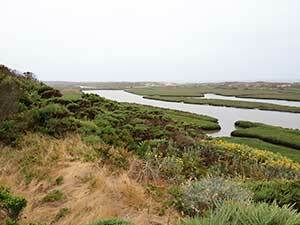 Resolve conflicts between flood control agencies and wetland protection and restoration. Develop guidance document for local planners for policy integration into local plans.